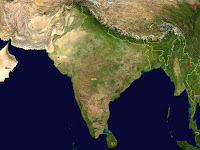 Indian Geography Quiz: Multiple choice questions (MCQs) based on Indian Geography asked in various examinations like RAS, IAS, IES, IRS and SSC conducted by RPSC, UPSC and other state level PSCs. Here is collection of top 40 Frequently asked Questions from Indian Geography in various examinations. Download Indian Geography Quiz in PDF Format. 1. Which one among the following is a major Tobaco-growing state ? 4. Which one of the following is the first state to have fully privatized its power distribution network ? 5. Which one of the followin layers of the Atmosphere contains Water vapour and dust particles ? 7. Which one of the followin states has the worlds largest fresh water island ? 8. The timber of which one of the following tree is used for making cricket bats? 11. Which of the following town is located eastern most ? 12. Which of the following statement is NOT Correct ? 13. Of the following four periods which one corresponds with the withdrawal of south-west mansoon in most of the Northern India ? 14. Which of the following city do not have refinery ? RasExam.com Tips: Lion-tailed macaque is an Old World monkey endemic to the Western Ghats of South India. A recent assessment for IUCN reports 3000-3500 of these animals live scattered over several areas in Karnataka, Kerala and Tamil Nadu. From 1977 to 1980, public concern about the endanged status of lion-tailed macaque became the focal point of Save Silent Valley, India's fiercest environmental debate of the decade. From 1993 to 1996, 14 troops were observed in Silent Valley National Park, Kerala, one of the most undisturbed viable habitats left for them. 20. The water of which one of the following lakes is used for producing salt ? 21. Which one of the following rivers originates in Brahmagiri range of western Ghats ? 22. To port blair which one of the following cities is geographically nearest ? 24. Retreating mansoon causes sporadic ranfall in which one of the following areas ? 25. Which one of the following pairs of National Highways crosses Andhra Pradesh, Karnataka and Maharashtra ? 26. Baglihar Hydropower Project is located on which one of the following rivers ? 27. Who among the following tribes live in the UT of Andaman and Nicobar Island ? 28. How many India states border Myanmar ? 29. Which among the following are the southern-most hills ? 30. Which among the following is the western-most city ? 31. Which one of the following rivers does Chambal river merge ? 32. Indus river originates in? 34. Gandhi Sagar Reservoir is of the river ? 35. Which one of the following district is well known for the cultivation of coffee ? 36. For which spice is Kashmir famous? 37. Which city of India stands on the River Hooghly? Rasexam.com Tips: Chranka Solar Park is the largest site built on a 2,000 ha plot of land near Charanka village in Patan district, Gujarat. This hosts about 17 different projects by different developers. On 19th April 2012, 214 MW had been commissioned. It also became the world's largest photovoltaic power station. When fully built out, the Charanka Solar Park will host 500 MW of solar power. ques. no 38 correct answer is A dhirubhai ambani solar park, rajasthan.